Wilhelmina Bernadina Skylight, Willa Bean for short, is a little cupid who lives on Nimbus, not far from the Milky Way. Little cupids are different from big cupids, for unlike big cupids who help grownups fall in love, little cupids help Earth children when they are sad or mad or need help with problems. Willa Bean lives on Cloud Four with her parents, older sister, and baby brother. She is different from her peers. Instead of having pink cheeks, straight hair, and white wings, Willa’s hair is wild and curly brown, she is laden with freckles, and her wings are purple with silver tips. Harper is Willa’s best friend. They love to collect treasures to hide in their treasure chest on Cloud Eight. The day before they are to attend Cupid Academy, Willa Bean and Harper meet to hide their treasures. Willa Bean arrives with full pockets and items she has stored in her mass of curls. Though excited about beginning school, Willa Bean is upset because she cannot fly. Harper tries to help her, offering instruction and support, but Willa Bean just cannot seem to get off the ground. Will she ever learn to fly? School proves to be an exciting adventure, and Willa Bean loves her new teacher, Miss Twizzle. When the little cupid, Vivienne, who sits in front of Willa Bean, rubs her the wrong way, Willa Bean finds herself in trouble. Will the other little cupids tease her when they learn she cannot fly? 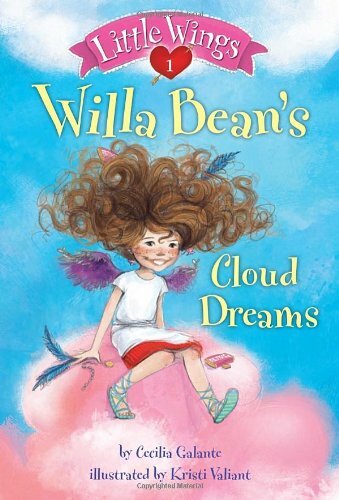 Willa Bean’s Cloud Dreams is the first book in the Little Wings series. Written in kid-speak, this story is sure to amuse and delight the picture book group. Ms. Valiant’s cheerful illustrations add to the whimsically sweet flavor of the text.